This week, I am thankful and honored to be included in the Blogroll of two famous Blog page - Singapore Stock Market News and Singapore Investment Bloggers. Even more gratifying is to hear from a random reader that she enjoy reading my blog. Thank you so much! Thank you! To make my blog less analogous to most investment blogs, I will try my best to also focus on companies without Institutional analysis. I shall begin today with catalist listed EMS Energy Limited. EMS Energy Limited (SGX: 5DE), through its subsidiary, EMS Energy Solutions "EES", designs, manufactures and installs engineering solutions and products such as drilling and well intervention systems, deck machineries, offshore cranes, etc. It also offers its customer’s aftermarket services. In addition, it owns a twenty-percent of Oilfield Services and Supplies Pte Ltd “OSS”, which relates to provision of downhole drilling tools. On 15 May, EMS completed acquiring the entire share capital of International Offshore Equipment for S$800,000. The acquisition is satisfied by issuance of 13,029,316 new ordinary shares at S$0.0614. NAV of International Offshore is S$480k with a net profit of S$163k from audited account available in 2012. Acquisition of International Offshore comes as a surprise, because their product range is similar to what EMS can already supply. There is no profound synergy. Int’l offshore is established in 2011, a mere three years into a industry that demands vast experiences of engineering capability and strong track records. In Int'l Offshore, we can neither find strong clientele nor impressive project references from its listed website. Acquisition price of 1.67x book value is also considered high for a company that is relative unheard of in the industry. Earlier in Feb this year, EMS announced the leasing of a 23k sqm waterfront facility at Tuas for period of 16 years 8 months commencing 1 May 2014. The new facility is expected to be ready in 2015 with a total cost of S$23.6m. Annual rental and fees expense of the new facility is estimated to be S$518k per year. The new facility is also five times bigger than EMS current facility, which had a book value of S$3.9m. To fund the new facility, earlier this month, EMS proposed to raise up to S$14.8m in Net Proceeds via 1-for-1 Rights Issue at price of S$0.02 per share. If fully subscribed, the Rights issue will double share capital base to 1.48b shares from 740.4m shares currently. 30-40% of the proceeds will be used to fund the waterfront facility, while the balance is use for working capital and to fund its order book. Years over years, EMS had borrowed from either share placements or rights issues citing future expansion. To date, we have yet to witness and meaningful return to the shareholder, since its RTO of Ecowater in 2007. This time, the expansion plan is even more aggressive with a facility five times bigger than its current one. Without a profitable and sustainable business model, it is hard to wonder how EMS can sustain additional overheads and increase debts over long term. The new facility serves mainly for the purpose of a S$45m Drilling Equipment Set “DES” contract awarded by Koastal Industries last November. What is more promising is the potential of another two more similar system worth up to a total of S$135m. EMS will deliver the first DES over 18 months to Koastal to be built in a China state-owned Shipyard (“Shipyard”). EMS current Order book stands at S$55m. From its corporate presentation announced Nov 2013, EMS main order book comprised of Koastal (52m), Fujian (3.1m), Keppel (1.5m), PC Vietnam (1.2m) and Natong Jialong (0.55m). The S$45m order awarded by Koastal is the largest to date. It is even incredibly larger than the entire market cap of EMS. Koastal Industries is the biggest shareholder of EMS owned by Ting, the CEO and Chairman of EMS. It is worthy to note that there is no mention if Koastal new Tender Rig has already secures a contract from an Oil Company. We have also no idea who are the exact owners or operator of the Rig. In situation of not having a contract, the Rig order may well be a speculative one which is highly risk-averse to any unprecedented events. We also need to ask if Koastal posses the necessary “muscles” or track records to convince any Oil company to award her a contract. In circumstances that Koastal is unable to secure a contract in time, the Tender Rig project will be delay, which means delay of DES order for EMS. This may prove to be an extremely risky for EMS, having committed to a large facility with huge expense overheads. EMS Management team had been changing years over years. Over the last 5 years, EMS announced 14 resignations of key officers. From past year annual report, we note that the entire current management team is also newly appointed. Having a new management team spells nothing wrong, but having one with relatively mediocre experiences and track records may be a cause of concern. EMS is founded in 1977 know as Engineering Marine Services as a steel fabricator. In 2007 through an RTO of EcoWater Limited “EWL" renamed itself to EMS Energy Limited. At the same time, EMS venture into a complete new business to provide customized engineering solutions in the oil and gas sector, taking a big step from its previous straight forward steel fabrication business. For the DES project, it means that EMS will have to use its short engineering experiences couple with a relatively new and inexperience management team to compete with the likes of International companies such as NOV or Aker Solutions with more than 100 years history and Billions in market capitalization. The DES is the most important piece of system in a Drilling Rig. Neither failure nor minor error can be compromised at the back of a very stringent requirement within the Oil and Gas sector. Whilst it is only logical for Koastal to award the contract to EMS due to their affiliations, Oil companies will have to be convinced to hire a Tender Rig from Koastal that comes with a relative unknown EMS supplied DES. From figure below, we can clearly see that majority of the company receivables is derived from related parties out of Koastal in Singapore. The heavy dependence of Koastal in its order book suggests EMS has yet to be truly recognized as a reputable solutions provider within the industry. EMS dispose 40% stake in its subsidiary “OSS” in 2013. 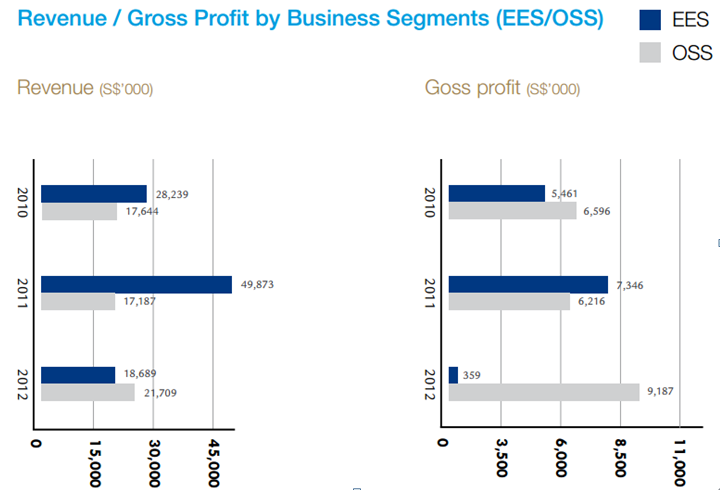 If we read the below charts extracted from ar2012, we see that OSS is generating revenue of S$21.7m with a very healthy gross profit of S$9.2m (>40% margin), compared to a miserable 2% in “EES” segment. It left us to ponder why the disposal of a highly profitable subsidiary by EMS. Is it to fulfill a change in business strategy or a desperate move to clear its raging debts? Despite a net profit of S$4.1m, EMS incurred an operational loss of S$3.8m in 2013. This is at the back of one time gain of S$7.9m from the disposal of a stake in its subsidiary. This implies two consecutive year of operating losses despite the positive outlook in the oil and gas sector. Total expenses reduced by 53.5% to S$8.99m (19.36m), due to absent of impairment of goodwill of S$10.22m in 2012. Operating expenses continue to be high as in fact staff costs increase from S$5.75m in 2012 to S$7m in 2013 due to increase expenses in China office. Current and total assets are S$17.7m and S$38.3m respectively. Cash and equivalent of S$3.5m is insufficient to cover the yearly staff cost of S$7m for year 2013. Current liabilities is S$16.4m which almost account for the entire liabilities at S$16.6m. The huge current liabilities is worrying, as it require the company to receive or raise funds urgently to repay its debt. Total borrowings which includes bank overdrafts, term loans, bills payables stands at S$5.8m, out of which S$5.5m is due in 6 months or less. Instead of mitigating its current liabilities, EMS continue to take on more debts with the leasing of new S$23m facility to fulfill a questionable DES order book. Trade and other receivables is S$14.1m which is more than 65% of its total sales revenue of S$21m. YOY receivables had been more than S$10m which exhibit the company inefficiency in it's cash collection. Goodwill of S$9.2m from consolidation as a group, remain to be convinced. Net assets increase from S$10.7m in 2012 to S$21.7m in 2013 mainly due to the absence of a one time impairement of goodwill in 2012 of S$10.2m. Net cash from operation activities is -S$12.3m compare to -S$1.2m a year ago. Cash from Investing activities is S$5.56m (1.41m) mainly from disposal of subsidiary offset by purchase of property, plant and equipment. Cash from Financing activities is S$4m (0.46m). This is due to issue of issuance of shares resulting in a gain of S$5.9m, plus new term loans of S$1.8m, partially offset by the repayment of term loans of S$1.57m and a increase in fixed deposits pledged of S$1.84m. EMS recorded its sales using percentage-of-completion method to account for its contract revenue. This method of accounting can under-estimate cost captured prior to the delivery of the project. This is especially risky when unanticipated costs occurs at later stage of the project, such as just prior to delivery or after delivery (warranty costs). Provision for warranty of S$1m is also low considering the complexity of the DES order.